On Oct. 15, a lawsuit alleging Harvard discriminates against Asian-American applicants went to trial in Boston. The Crimson updated this article with a summary of what went down in the courtroom every day the trial lasted. Protesters hoist opposing signs at two different rallies — separated by four miles and a vast ideological chasm — held in Boston and Cambridge the day before the launch of the Harvard admissions trial. On Monday Oct. 15, 2018, a high-stakes and high-profile lawsuit alleging Harvard's admissions process is discriminatory went to trial in a Boston courthouse. The suit, brought by anti-affirmative action advocacy group Students for Fair Admissions in 2014, charges that the College rejects deserving Asian-American applicants in favor of less qualified applicants of other races. Harvard has repeatedly and unequivocally denied all allegations of discrimination. The case may wind up deciding the fate of affirmative action in the United States. The trial wrapped up in three weeks, leaving matters in the hands of Judge Allison D. Burroughs, who is expected to issue a final verdict — on her own, without a jury — some time in the next few months. No matter how Burroughs rules, though, the disappointed party will likely appeal. A cascading series of appeals could bring the matter before the Supreme Court, whose recent shift to the right — cemented by the appointment of controversial and conservative Associate Justice Brett M. Kavanaugh — means the nation's highest court will probably side with SFFA. Throughout October and into November, Harvard affiliates, reporters, and curious members of the public packed into three crowded courtrooms every weekday to listen to University and SFFA lawyers do battle over the legality and viability of race-conscious admissions on college campuses. 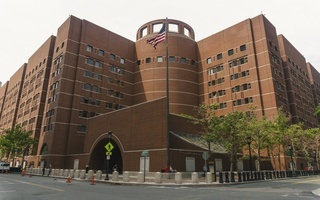 Trial proceedings — held in Courtroom 17 in the John Joseph Moakley United States Courthouse — typically lasted from around 10 a.m. to 3 p.m.
For the duration of the trial, The Crimson updated this article with a brief summary of what went down in the courtroom each and every day. Relive a tumultuous three weeks below. 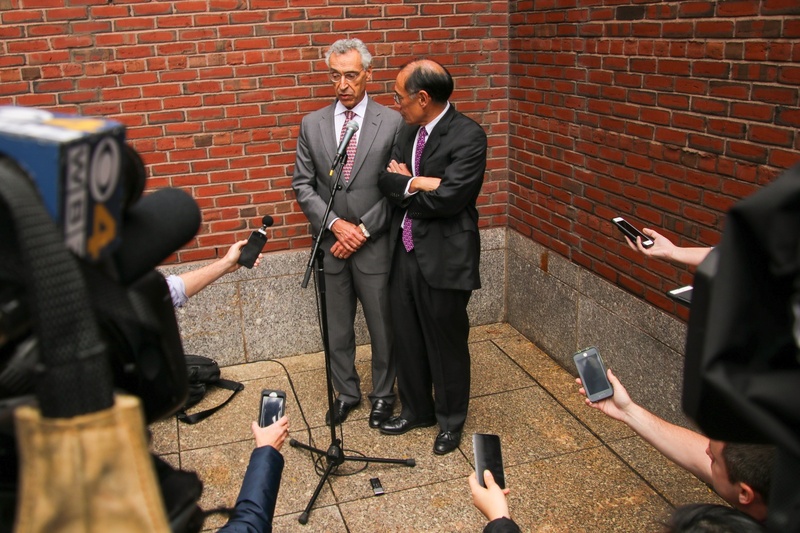 Seth P. Waxman '73 and William F. Lee '72 speak to members of the press outside John Joseph Moakley United States Courthouse immediately following the conclusion of the three-week-long Harvard admissions trial. WHO: The final day of the trial belonged to the lawyers. Attorneys for both Harvard and SFFA gave lengthy closing statements to an overflowing courtroom. Dozens of Harvard undergraduates showed up for the last session of the trial, many of them wearing school gear and carrying copies of The Crimson. John M. Hughes wrapped things up for SFFA. Afterwards, William F. Lee '72 and Seth P. Waxman '73 took the stand to sum up Harvard's case. WHAT: SFFA charged yet again that Harvard discriminates against Asian-American applicants, rehashing allegations that College officials allowed racial prejudice to dictate the way they treated high schoolers of Asian heritage in the admissions process. The University, meanwhile, denied all these charges and sought to undermine SFFA's credibility. Read the full story here. Hughes went first. Judge Allison D. Burroughs encouraged him to speak directly into the microphone, noting that "You have a cast of thousands hearing what you have to say this morning." So many people traveled into Boston Friday that they filled two overflow courtrooms. The SFFA lawyer asserted that "bias and stereotyping" have snuck into the College's admissions system — though he said its individual admissions officers are "well-meaning people." He said the stereotypical view that Asian Americans are a monolithic "model minorit[y]" pervades Harvard admissions. "Harvard suggests Asian Americans are a group of one-dimensional academic superstars," he said. Documents filed in court over the summer appeared to show that Harvard admissions officers give poorer personal ratings to Asian-American applicants. To prove his point, Hughes displayed copies of college applications submitted by Asian Americans and reviewed by Harvard admissions officials. The papers bore the words "shy" and "quiet" in large font. Hughes noted that some Asian-American students who received very positive ratings for their personal traits from alumni interviewers later earned very average scores from Harvard's admissions office. Hughes said Harvard has offered no compelling and plausible explanation for the discrepancy in personal scores achieved by students of different races and said that is "alone sufficient to prove race is affecting the personal score." He also extensively critiqued a pre-trial analysis of Harvard admissions data conducted by University of California at Berkeley professor David E. Card, whom Harvard paid for his work. Card claims his analysis proves the College does not discriminate on the basis of race in its admissions process. Hughes spoke for more than an hour and appeared emotionally invested in his speech, often slamming his fist on the table in front of him. After Hughes finished speaking and the court took a short break, Lee approached the stand and thanked the judge on behalf of "the Harvard community." Then he launched into a fiery defense of Harvard admissions — and an equally fiery attack on SFFA. Lee quoted SFFA lawyer Adam K. Mortara's opening statement, noting that "The wolf of racial bias is at Harvard's door and at the door of this courthouse." But he said the wolf is SFFA. "It is those who would drastically reduce the number of African-American and Hispanic students on our university and college campuses today," he said. He noted that, while eight current and former Harvard students chose to testify in support of the College over the course of the trial, none of the students whom SFFA is representing showed their faces in court. SFFA originally filed suit against Harvard in 2014 on behalf of several Asian-American students who allege they were unfairly spurned during the College's admissions process; these students have chosen to remain anonymous throughout the suit and trial. Lee said that "no one who took the stand had ever met with or spoken with" even one of these students. Lee then listed a set of logical contradictions he argues exist in SFFA's allegations aainst Harvard and criticized a pre-trial analysis of Harvard admissions performed by Duke economist Peter S. Arcidiacono, a statistical expert paid by SFFA. That analysis purported to prove the College discriminates against Asian-American applicants. Lee dubbed Arcidiacono's work "data mining." He thanked the eight current and former students who testified in court this week, calling their words "powerful." Each of the eight witnesses drew on personal experiences — including race-related bullying and comfort found in College affinity groups — to argue that a race-blind admissions process would decrease diversity on campus and drastically worsen the Harvard experience. Lee reiterated Harvard's commitment to diversity and said the College had considered race-neutral alternatives and found them all lacking. "We've heard from the students themselves. We've heard from the students who are living diversity every day," Lee said in closing. "Although much progress has been made, there is much to be done." — Staff writers Shera S. Avi-Yonah, Delano R. Franklin, Iris M. Lewis, and Samuel W. Zwickel contributed reporting. 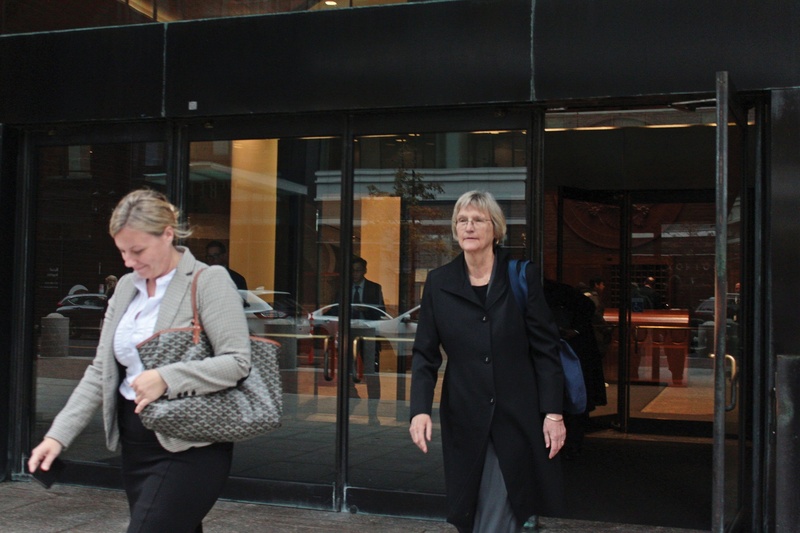 Former University President Drew G. Faust left court immediately after testifying in the Harvard admissions trial on Thursday, Nov. 1.
WHO: Harvard's paid statistical expert wrapped up his testimony and a former University president stepped up to testify on the penultimate day of the trial. First, Harvard expert witness and University of California at Berkeley professor David E. Card took questioning from SFFA lawyer Adam K. Mortara and Harvard attorney Seth P. Waxman '73. Director of Admissions Marlyn E. McGrath '70 was up next, called to testify for a second time in the trial by SFFA. She answered questions from Mortara and from Harvard's lead lawyer William F. Lee '72. Former University President Drew G. Faust closed out the day. She faced inquiries from Lee and SFFA lawyer John M. Hughes. WHAT: A lot of people played defense. Card continued to defend his statistical analysis of Harvard admissions data, McGrath defended earlier comments she made asserting Harvard does not issue written guidance on how to use race in its admissions process, and Faust defended diversity initiatives she pursued during her 11-year tenure in the University's top job. As he did in previous testimony, Card insisted his mathematical models show that Harvard does not discriminate against Asian-American applicants. Mortara questioned Card on whether he took all relevant sources of information into account in his findings. McGrath then rose to take the stand a second time; she already testified about a week ago. The long-serving director of admissions faced grilling over how and when the College adopted unprecedented written rules detailing how admissions officers can use race to evaluate Harvard hopefuls. Read the full story here. When McGrath spoke in court last, she had said Harvard has never produced written guidance telling application reviewers how they can weigh race when calculating the "personal rating," one of several metrics the College relies on to assess high schoolers. That didn't turn out to be fully true. A document submitted as evidence in the trial's second week showed that Harvard added explicit guidance on race to its application "reading procedures" for the Class of 2023. The new guidelines state that "an applicant's race or ethnicity should not be considred in assigning the personal rating." McGrath admitted the existence of the new guidance Thursday and said she originally testified the new rules did not exist because she assumed she could consider only reading procedures produced between 2012 and 2014. She noted that Harvard updates its procedures every year and called the addition of explicit written guidance related to race a "moderate" change on a scale of "small" to "large." Faust succeeded McGrath behind the witness stand. The former University president and Civil War historian spent most of her testimony defending initiatives she pursued during her 11 years in power meant to promote diversity across the University's schools. Read the full story here. "I feel that my tenure has been committed in considerable part to expanding openness, access to Harvard," Faust said. "There is no place for discrimination of any kind at Harvard." She also said in court that multiple Supreme Court precedents support Harvard's race-conscious admissions policies and "underscore" the importance of diversity in higher education. At one point, Faust faced questioning from Hughes about the University's 1920s-era discrimination against Jewish applicants. At the time, University President Abbot Lawrence Lowell instituted an admissions system designed to limit the number of Jews attending the school. Faust said the Lowell-era anti-Semitism is not relevant to the College's current admissions policies. "It was not a proud chapter in Harvard's history," Faust said. The final day of the trial will kick off Friday morning. Lawyers from both sides are slated to give closing statements. — Staff writers Alexandra A. Chaidez, Delano R. Franklin, Molly C. McCafferty, and Samuel W. Zwickel contributed reporting. University of California at Berkeley Professor David E. Card, whom Harvard paid to analyze its admissions data, again took the witness stand. Harvard lawyer Seth P. Waxman ’73 examined Card. Students for Fair Admissions lead attorney Adam K. Mortara also questioned Card. 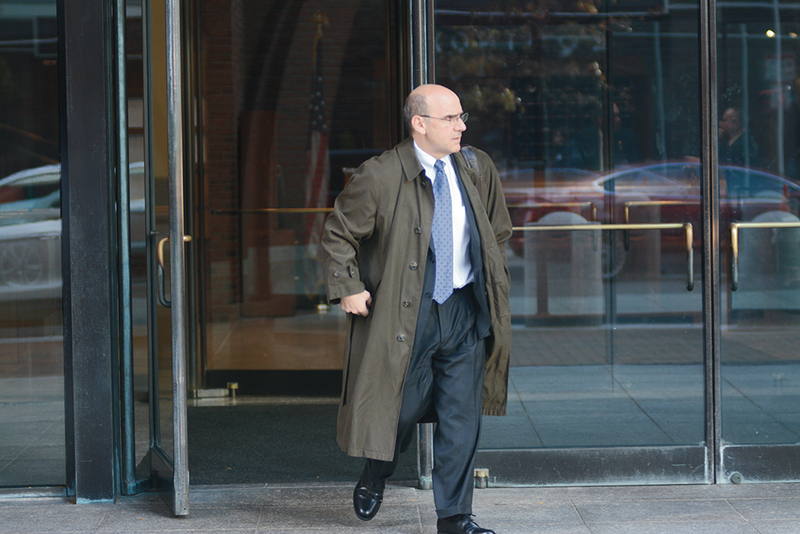 On Card's second day in court, Waxman's questioning served primarily to reiterate the points Card made Tuesday. Card began the morning by emphasizing the four factors that he said SFFA expert witness Peter S. Arcidiacono left out: parental occupation, intended career, staff interview indicator, and the personal rating. Card's testimony relied heavily on the methodological differences between Arcidiacono and himself. "It's like there's some kind of schizophrenia going on," Card said of Arcidiacono's interpretation of the role of race in the personal rating. "I just do not find that understandable or consistent." Unlike Arcidiacono, Card emphasized that academic prowess does not necessarily inform the personal score. In the afternoon, Card presented an analysis showing that — all of factors being equal — race is less decisive than an applicant's teacher ratings, alumni ratings, area of origin, docket, and intended career or major. He argued race is only a significant boost for those candidates who already have several other factors going for them. Waxman asked Card to directly address SFFA’s claim that Harvard balances admitted classes by race. “In my view, there’s no evidence that that is going on,” Card said, showing charts to back up his claim. After a lunch break, Waxman and Card walked through the professor’s breakdown of four race-neutral alternatives previously proposed by affirmative action opponent Richard D. Kahlenberg: eliminating policies that allegedly help white applicants, placing more weight on socioeconomic status, expanding policies that promote diversity through recruitment, and using geographically based policies. In each case, Card concluded the new system would result in a markedly less diverse class. SFFA lawyer Adam K. Mortara questioned Card next. Mortara focused most of his questions on his concerns with Card’s statistical analysis. The day’s proceedings ended after Mortara created an Excel spreadsheet and asked to submit it to the record as evidence. Waxman objected, saying there was no foundation for this evidence. “The foundation is I just made it,” Mortara said. Burroughs then stepped in with a pronouncement that she was tired and assumed Card was tired, ending Wednesday’s session. The court will reconvene Thursday morning at 9:30 a.m.
— Staff writers Shera S. Avi-Yonah, Iris M. Lewis, and Aidan F. Ryan contributed reporting. WHO: The former president of Brown University and Harvard's paid statistical expert stepped up to testify Tuesday. Ruth J. Simmons, the current president of Prairie View A & M University and the former president of Brown, took the witness stand first. Simmons earned a Ph.D. in Romance Language and Literature at Harvard before later becoming the first black president of an Ivy League school. David E. Card, a University of California at Berkeley professor whom Harvard employed to analyze its admissions data ahead of the trial, succeeded Simmons. Simmons and Card took questioning from Harvard lawyer Seth P. Waxman '73 and from a member of SFFA's legal team. WHAT: Simmons vehemently defended Harvard's admissions policies. Card defended his pre-trial statistical analysis that concluded the College does not discriminate against Asian-American applicants. Simmons said she supports Harvard's race-conscious admissions process and said it is important that institutions of higher education maintain diverse student bodies. She also went to bat for Harvard's practice of giving "tips" — meaning a special boost — to legacies, students linked to top donors, children of faculty and staff, and both recruited and non-recruited athletes. Simmons said alumni of elite universities can make a serious positive impact on their alma maters, making it "important" to give an extra nudge to legacy applicants. At Harvard, the legacy admit rate is five times that seen by non-legacies. "It is entirely appropriate for them to believe that it would be wonderful if their children could also enjoy the same benefits that they enjoyed as students," Simmons said of alumni. Read the full story here. Later in the day, Card sought to explain his statistical model of the Harvard admissions process. At times, he broke out a whiteboard and sketched graphs and charts. A fire alarm briefly interrupted his presentation around 2 p.m.
Card challenged the conclusion reached by Duke economist and SFFA-paid expert Peter S. Arcidiacono, whose own analysis of Harvard admissions data purported to prove that the school discriminates against Asian Americans. Card said Arcidiacono's model left out several relevant applicant traits admissions officers consider, leading to "skewed" results. His own model, Card said, accounted for these variables and found no discrimination. "My conclusion is that the statistical evidence does not suport the claim that Harvard discriminates against Asian-American applicants... there is no statistical evidence that Harvard has engaged in racial balancing." "Race is a factor in admissions to Harvard. It is a factor that is valued in some candidates... There is never a situation where race alone is determinative." "Harvard, if it were to eliminate the consideration of race, there is a tradeoff in that using race-neutral alternatives would necessarily, to achieve the same level of diversity, would result in a reduction in the quality of the classes." 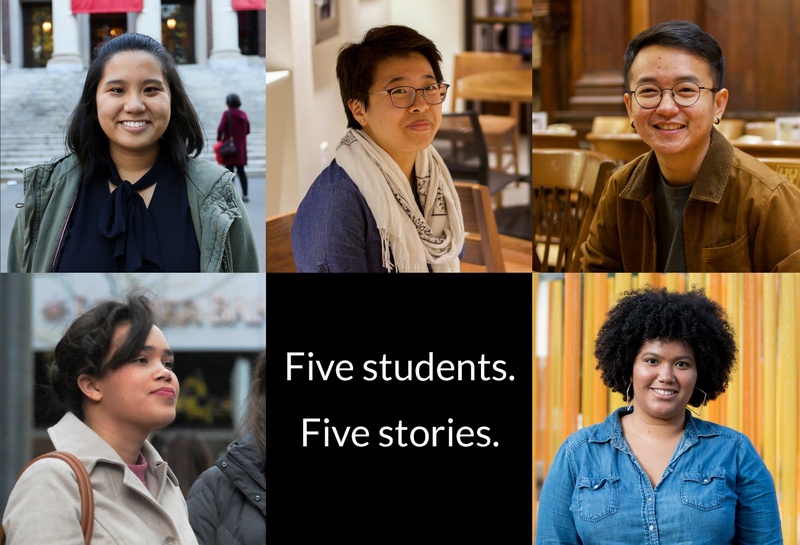 — Staff writers Alexandra A. Chaidez, Iris M. Lewis, Molly C. McCafferty, Sanjana L. Narayanan, and Cindy H. Zhang contributed reporting. WHO: Eight current and former Harvard students took the witness stand Monday to argue for race-conscious admissions — and against a race-blind process. Speakers included the below — and you can read profiles of every student here. WHAT: The students and alumni mounted an impassioned defense of affirmative action and detailed the vital benefits they say it brings to Harvard's campus. Monday's witnesses, all of whom are non-white, drew on personal experiences — including tales of childhood bullying, fears over Harvard's whiteness, and comfort found in College affinity groups — to argue the school must stick to its race-conscious admissions policies. Many said their racial or ethnic identity shaped their early life and that the Harvard application process allowed them to take pride in their heritage. Some said they would not have applied to Harvard if the College did not consider race as a factor when evaluating applicants. "I personally benefited from affirmative action," Diep said. "It allows my immigration history to be taken into account, my own experiences taken into account." Diep's testimony drew applause from courtroom spectators. Others said they found Harvard's campus uncomfortably and overwhelmingly white — spurring them to join campus affinity groups. The students and alumni said it was comforting to find a space filled with people who looked like them. The witnesses said the elimination of race-conscious admissions would mean fewer minority students matriculate at Harvard each year. On a campus where many undergraduates of color already feel isolated and alone, this decrease would be disastrous, the students said. "I think that my love for Harvard is entirely or mostly rooted in the people I encounter," Trice said. "It would be a shame if that diversity is lost because it means the world to me." — Staff writers Shera S. Avi-Yonah, Alexandra A. Chaidez, Delano R. Franklin, Molly C. McCafferty, Aidan F. Ryan, and Samuel W. Zwickel contributed reporting. WHO: Harvard lawyer William F. Lee '72 continued his cross-examination of SFFA expert witness and Duke economist Peter S. Arcidiacono. WHAT: Lee sought to show that Arcidiacono's pre-trial analysis of Harvard admissions data — in which the Duke professor concluded the College discriminates against Asian-American applicants — was fatally flawed. Lee's argument hinged on proving that Arcidiacono's analysis suffered from "omitted variable bias." Arcidiacono excluded parental occupation, intended career, and staff rating indicator — whether or not the applicant had undergone a staff interview — when setting up his model of Harvard's admissions system. Lee noted that, in real life, Harvard admissions officers consider all three of these factors when evaluating candidates. Lee — who also serves as senior fellow of the Harvard Corporation, the University's highest governing body — argued that, were Arcidiacono to add back in certain missing factors, the negative effects the Duke professor calculated Asian-American students see in the Harvard admissions process would become statistically insignificant. He called Arcidiacono's findings "implausible" and "unreliable." Later, courtgoers watched a pre-recorded video of Harvard Dean of Admissions and Financial Aid William R. Fitzsimmons '67 giving a court deposition on August 3, 2017. In the video, Fitzsimmons — wearing a blue tie — said he thinks Harvard is doing everything it can to achieve socioeconomic diversity. The College's student body skews wealthy; when Dean of the College Rakesh Khurana testified in the trial earlier this week, he said he's okay with that. Khurana also said he does not believe Harvard's student body should match the socioeconomic makeup of America. Judge Allison D. Burroughs ended the day's proceedings relatively early around 1:30 p.m. She closed by reminding her audience that eight current Harvard students and recent graduates are set to testify in court Monday and added she hopes "younger lawyers" will examine them. — Staff writers Alexandra A. Chaidez, Delano R. Franklin, Iris M. Lewis, Samuel W. Zwickel, and Sanjana L. Narayanan contributed reporting. SFFA affiliates John M. Hughes (left), Adam K. Mortara (center), and Edward Blum (right) exit the court Thursday. WHO: SFFA expert witness and Duke economist Peter S. Arcidiacono took the witness stand Thursday morning at 9:30 a.m. and did not leave it — apart from a break for lunch — until proceedings closed for the day at 4 p.m. He took questions first from SFFA lawyer J. Scott McBride. Harvard attorney William F. Lee '72 then stepped up to quiz Arcidiacono. WHAT: The ninth day of the trial was all about data. Arcidiacono introduced himself as an expert on affirmative action and college admissions decisions. He confirmed he is being paid by SFFA for his work on the case. In the course of his analysis — which relied on data from the admissions cycles starting with the Class of 2014 and ending with the Class of 2019 — Arcidiacono also noted that 86 percent of recruited athletes were admitted, 33.6 percent of legacy students were admitted, 42.2 percent of applicants on the Dean or Director’s List were admitted, and 46.7 percent of children of faculty or staff were admitted. He said his conclusion is that there exists a “systematic” pattern in which African American students and Hispanic applicants see higher overall and personal scores than Asian students along with a higher probability of admission. “Race very much appears to be influencing the overall rating, the personal rating, and the admit rate,” Arcidiacono said. This is not true, he said, of the academic and extracurricular ratings. Around 2 p.m., Lee began questioning Arcidiacono. The Harvard lawyer noted that Arcidiacono did not meet with a single student at Harvard while conducting his investigation of the admissions process. Lee also asked whether Arcidiacono understood that eliminating the consideration of race in admissions would lead to a decreased number of African-American and Hispanic-American admits — to which Arcidiacono replied, "Yes." At one point, when asked whether there is a "white penalty" in the Harvard admissions process, Arcidiacono said that "white penalty is the same thing as an African-American or Hispanic tip." Lee also brought up Arcidiacono's time serving as the chair of the admissions committee of the Duke Economics department. Lee noted that Arcidiacono implemented interviews in the admissions process — and that the percentage of African Americans in the department decreased from 7.5 percent to 2.09 percent the year after Arcdidiacono became chair. — Staff writers Alexandra A. Chaidez, Cindy H. Zhang, Molly C. McCafferty, and Sanjana L. Narayanan contributed reporting. 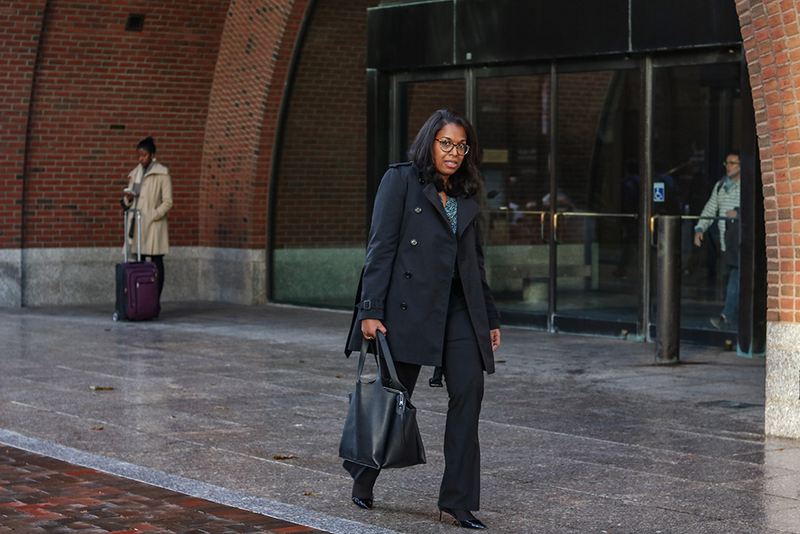 Danielle Y. Conley, a partner at the WilmerHale law firm and a member of Harvard's admissions trial team, leaves the John Joseph Moakley United States Courthouse Wednesday. WHO: Three Harvard Admissions officials took the stand Thursday, as did a former analyst for the University’s Office of Institutional Research. Harvard witness Mark F. Hansen, who currently serves as the Director of Research Technology at MIT’s Consortium on Financing Higher Education, took the witness stand to testify about his former work as an analyst for Harvard’s Office of Institutional Research. He was cross-examined by SFFA attorney John M. Hughes; Harvard lawer Felicia H. Ellsworth followed with her own direct examination. After, Harvard witness Roger Banks — a Senior Associate Director of Admissions at the College who has worked at the admissions office since 1980 — testified about how race-related statistics are discussed at top universities. J. Michael Connolly from SFFA cross-examined Banks; Ellsworth again followed with direct examination. After lunch, SFFA Lawyer Adam K. Mortara and University lawyer Ara B. Gershengorn ’93 questioned Assistant Director of Financial Aid and Senior Admissions Officer Charlene Kim. Tia M. Ray '12, Admissions Officer and Director of the Undergraduate Minority Recruitment Program, took the stand next to answer questions from SFFA Lawyer Katherine L.I. Hacker and then University lawyer Danielle Y. Conley. WHAT: Harvard admissions officials repeated previous assertions that the University does not discriminate in its admissions process and that race is simply one factor among many that admissions officers weigh when evaluating candidates. Hansen again defended a 2013 OIR report that found the College's admissions system disadvantages Asian Americans. In a moment of levity, Judge Allison D. Burroughs opened the day’s proceedings by referengin the upcoming Halloween festivities. She said she has been busy making sure her two boys have cool costumes. One of them plans to dress up as the character Link from Zelda. 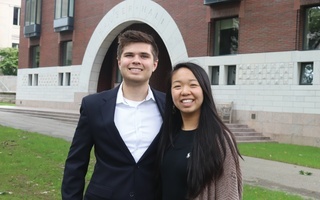 For the second time during the trial, a representative from the OIR took the stand to defend the group’s 2013 internal report that concluded the College’s admissions policies produce “negative effects” for Asian Americans — a report Hansen insisted was preliminary and inconclusive, as Harvard has done since it became public in court filings this summer. Connolly questioned Banks about his consideration of race in admissions decisions. Banks said that, at full committee meetings held to make final admissions decisions, Dean of Admissions William R. Fitzsimmons ’67 keeps officers updated on “where we are along a variety of planes” — including the burgeoning racial demographics of that year's class. Connolly said he has “never” been told to admit more or fewer applicants from a certain racial background. Charlene Kim, Banks’ fellow admissions officer, testified that she has never received written instructions on how admissions officers should use race when considering applicants. But she said Harvard's Office of General Counsel talks to the admissions office every year about the “legal landscape” surrounding the role race can play in admissions. Finally, Ray took the stand. She fielded questions on the “lop” process via which admissions officers remove certain students to scale down the admitted class to an appropriate size. Ray admitted that ethinicity, lineage, athlete status, and financial aid hold sway in the lopping process but said these are "not the only factors" considered. — Staff writers Aidan F. Ryan, Caroline S. Engelmayer, and Samuel W. Zwickel contributed reporting. A 2012 College admissions casebook that surfaced in the trial Monday runs through what made 11 past Harvard applicants successful or unsuccessful, offering a window into what the school seeks in candidates as well as what it shuns. Read the full story below. WHO: Dean of the College Rakesh Khurana wrapped up his testimony Tuesday and former Dean of the Faculty of Arts and Science Michael D. Smith replaced him behind the witness stand. SFFA lawyer Adam K. Mortara questioned Khurana first. Then Harvard attorney Danielle Y. Conley stepped up to quiz the dean. Later, SFFA attorney J. Scott McBride questioned Smith. Harvard lawyer Seth P. Waxman '73 took his turn asking questions after McBride. WHAT: Khurana continued to defend Harvard's race-conscious admissions policies, repeatedly asserting the school does not discriminate. Smith took fire over a committee he chaired months ago that explored race-neutral alternatives to the admissions process before concluding the College should stick to its current model. Facing grilling from Mortara over the fact that Harvard's student body skews wealthy, Khurana stuck to his guns. "I think higher education is part of the solution to addressing problems of inequality," he said. Later, the dean denied SFFA's charges that Harvard rejects qualified Asian-American applicants in favor of less deserving students of other races. Drawing on his personal experiences, he asserted the school had never done so. "If I felt there was any kind of systematic discrimination, intentional discrimination, as a dean of the College, as a professor, as a father I would have rung multiple alarm bells," Khurana said. And Khurana argued more broadly for the merits of diversity — whether that's diversity in academic interests or in political and racial backgrounds. He said diversity in general helps students realize no one "has a monopoly on the truth" and that racial diversity is important to achieve because it "can shape our experience of ourselves." On his first day of testimony, Smith took the stand wearing a blue shirt and a light-orange tie laced with a grey diamond pattern. He spoke in a low voice, at one point prompting Judge Allison D. Burroughs to note that some in the courtroom could not hear him. Smith spent most of his three-hour long testimony Tuesday defending his work chairing a Harvard committee formed in 2017 and tasked with exploring race-neutral alternatives to affirmative action. The "Smith Committee" ultimately concluded that "Harvard could not both achieve its diversity interests and achieve other equally important educational outcomes, such as academic excellence" — a finding Smith stuck to on Tuesday. Read the full story here. In other news, a confidential casebook revealing why the College accepted and rejected 11 past applicants surfaced in court filings Monday. The book, used to train admissions officers on how to evaluate candidates, offers a window into what Harvard seeks out in the admissions process — and what it shuns. Read the full story here. — Staff writers Alexandra A. Chaidez, Delano R. Franklin, Iris M. Lewis, and Molly C. McCafferty contributed reporting. WHO: Dean of the College Rakesh Khurana took the witness stand for the first time Monday. He is the highest-ranking Harvard administrator to speak in court to date. SFFA expert witness Richard D. Kahlenberg ’85, who produced a lengthy analysis of Harvard’s admissions data, also testified for the first time Monday. SFFA attorney Patrick Strawbridge directly examined Kahlenberg for the first half of the morning; Harvard lead trial lawyer William F. Lee ’72 followed up with a fiery cross-examination. Later, Harvard College’s Director of Admissions Marlyn E. McGrath '70 — who first took the stand Friday — answered a series of questions from Lee and from Students for Fair Admissions lawyer Adam K. Mortara. After McGrath stepped down, Khurana took her place, facing off against Mortara. WHAT: SFFA expert Kahlenberg argued that Harvard has not adequately explored race-neutral alternatives to its admissions process. In the afternoon, during a tense bout of questioning, Khurana said he is okay with the fact Harvard’s student body skews wealthy. Kahlenberg testified there are viable race-neutral alternatives that would allow Harvard to achieve a racially diverse student body without explicitly considering race in the admissions process. It is currently legally mandated that universities consider race-neutral alternatives before adopting race-conscious admissions policies. After lunch, Khurana took the stand wearing a blue sports coat and a purple checkered shirt. Mortara pressed Khurana on whether the Harvard admissions process disadvantages Asian-American applicants and Khurana repeatedly insisted it does not. Mortara then asked whether Khurana is aware that, while the portion of U.S. households boasting an income of over $150,000 hovers around 5 percent, individuals in that income bracket make up roughly 30 percent of Harvard’s student body. Khurana did not dispute either statistic. “We’re not trying to mirror the socioeconomic or income distribution of the United States,” Khurana said. “What we’re trying to do is identify talent and make it possible for them to come to a place like Harvard." Read the full story here. — Staff writers Aidan F. Ryan, Cindy H. Zhang, and Samuel W. Zwickel contributed reporting. Students for Fair Admissions President Edward Blum exits the courthouse on Oct. 19, the fifth day of the Harvard admissions trial. WHO: A series of Harvard administrators took the stand Friday to face cross-examination from both SFFA and University attorneys. Harvard's Director of Research for Admissions and Financial Aid Erica J. Bever was up first, continuing her testimony from the day before. SFFA laywer J. Scott McBride grilled Bever for much of the morning; Harvard lawyer Felicia H. Ellsworth took her turn asking questions after McBride finished. Erin Driver-Linn — the Harvard School of Public Health Dean for Education — stepped to the witness stand after Bever. She took questions from SFFA lawyer Katherine L. I. Hacker and, later, Ellsworth. The third and final witness Friday was Marlyn E. McGrath '70, Harvard's director of admissions. She answered questions from SFFA attorney Adam K. Mortara and from Lee. Lee was still questioning McGrath when Judge Allison D. Burroughs adjourned proceedings for the day at 4 p.m. He will continue his queries Monday. WHAT: Bever defended Harvard's apparent failure to take significant action to respond to a 2013 internal report that concluded the College's admissions process produces "negative effects" for Asian Americans. Driver-Linn also discussed the report. McGrath faced a series of questions from SFFA lawyers about internal emails she exchanged with Harvard admissions officers and with her daughter. Bever spoke at length about the 2013 report, which she helped produce as part of her work for Harvard's Office of Institutional Research. She emphasized that the statistical models OIR employees used to analyze Harvard admissions left out hundreds of variables. And she noted that many factors College reviewers consider are simply not quantifiable. Harvard has repeatedly insisted the 2013 report was limited in scope, relied on incomplete data, and was not meant to conclusively evaluate whether the College discriminates. Driver-Linn, who was also involved in producing the 2013 report, spoke mostly on the same topic. She, too, emphasized that OIR models left out specific applicant traits — factors such as candidates' exceptional artistic talent and personal essays. She said the OIR analyses "weren't designed to look for evidence of bias or discrimination." When McGrath stepped to the stand, SFFA lawyers had ammo ready. The attorneys introduced a series of Harvard admissions-related emails, some sent by McGrath and some sent to her. Mortara zeroed in on one exchange between McGrath, her daughter Elizabeth Lewis, and long-serving D.C.-area admissions officer David L. Evans in which the trio discussed a less-than-inspiring candidate who had won a spot on the mythical "Z list," a small pool of Harvard admits whose acceptance is deferred for one year. Court documents published over the summer showed that Z listers are overwhelmingly white and wealthy. "I'm not sure he was terribly strong (though he was a black legacy)," Lewis wrote. "Terrible case," McGrath replied. "We did it entirely for contingent reasons. We never see strong black candidates from [redacted]... I feel badly." Lee objected to the introduction of this email chain, arguing it has no relevance to Harvard's alleged discrimination against Asian-American applicants. Mortara countered that the emails are germane because they prove that Harvard is not entirely truthful and transparent in its admissions process. Amid frequent objections from Lee, Mortara finished his questioning by asking why the College frequently grants staff interviews to the children of top donors, legacies and athletes — and by pressing her on why Harvard does not use Common Application data on religious identity in its candidate evaluation process. McGrath said the College does not track religious identity due to advice given by Harvard's legal counsel. When his turn rolled around, Lee walked McGrath through each piece of evidence Mortara introduced and sought to discredit the SFFA laywer's arguments. He also began asking McGrath about the casebooks Harvard uses to train its admissions officers, but time ran out before he got very far. Lee said he will continue his questions Monday. — Staff writers Alexandra A. Chaidez, Cindy H. Zhang, and Shera S. Avi-Yonah contributed reporting. Note: Overall admissions rate also includes Native American/Native Hawaiian, International, and Unknown/Other students. WHO: The College's dean of admissions and financial aid William R. Fitzsimmons ’67 wrapped up his testimony and successive Harvard admissions officers stepped up to take his place behind the witness stand. In the morning, Fitzsimmons faced quizzing from William F. Lee '72, the University's lead trial lawyer and the senior fellow of the Harvard Corporation. Fitzsimmons finally departed the witness stand for good Thursday after spending much of the past four days answering questions from various attorneys. Later, long-time Harvard admissions officer Christopher J. Looby took Fitzsimmons's place. He took questions first from SFFA lawyer Adam K. Mortara and then from Harvard attorney Danielle Y. Conley. After Looby, it was Harvard Director of Research for Admissions and Financial Aid Erica J. Bever's turn. She took questions from SFFA lawyer J. Scott McBride. Thursday's alloted court time drew to a close before McBride finished his set of prepared questions for Bever. WHAT: Fitzsimmons walked through Harvard's admissions process in detail. Looby spoke about whether and how College admissions officers consider race when evaluating applicants. Bever took questions about a confidential 2013 report she helped produce that suggested Harvard's admissions system produces "negative effects" for Asian Americans. Lee picked up where he left off on day three, asking Fitzsimmons to tell the public how Harvard's admissions process actually works. Fitzsimmons spoke at length, describing the steps of the candidate review process. He also discussed what Harvard reviewers look for in applicants, noting that employees weigh both academic and personal ratings. He said race is never a negative factor during evaluations. Fitzsimmons later talked about the "Dean's Interest List," a special and private list of Harvard applicants who are often related to or of interest to top donors. Students on the list tend to see higher acceptance rates. Fitzsimmons said roughly 15 to 20 students on the list are children of "significant donors" and said he tries to give top donors "an advance warning" if their children will not be admitted to Harvard. At one point during his questioning of Fitzsimmons, Lee introduced a detailed dataset that contained information on Harvard applicants and admits stretching from the Class of 2000 to the Class of 2017. A Crimson analysis of that data revealed that, over a nearly two-decade period starting in 1995, Asian-American applicants to the College saw the lowest acceptance rate of any racial group that sought admittance to the school. Read the full story here. Looby was up next. In reply to questions from SFFA's lawyers, Looby suggested Harvard admissions officers do not receive extensive guidance on how to weigh race in the evaluation process. After much pressing from SFFA, Looby said that the College tells admissions employees, "Just be careful with what you write." Later, during cross-examination from Harvard lawyer Conley, Looby clarified that he has "absolutely" received extensive training on weighing "race as one factor of many." Bever took the stand after Looby and immediately faced fire from SFFA lawyer McBride, who grilled her about the 2013 Harvard report and what he asserted were inconsistencies between her previous court testimony and what she said in certain depositions. After the trial ended for the day, Lee paused on his way out to take questions from a scrum of reporters. Munching on a CLIF bar, Lee said Harvard's race-conscious admissions policies have been "blessed" time and again by the Supreme Court. — Staff writers Molly C. McCafferty, Sanjana L. Narayanan, and Aidan F. Ryan contributed reporting. The University's General Counsel Robert W. Iuliano '83 exits the courthouse on the third day of the Harvard admissions trial. WHO: The College's dean of admissions and financial aid William R. Fitzsimmons ’67 remained on the witness stand for hours on the third day of the Harvard admissions trial. 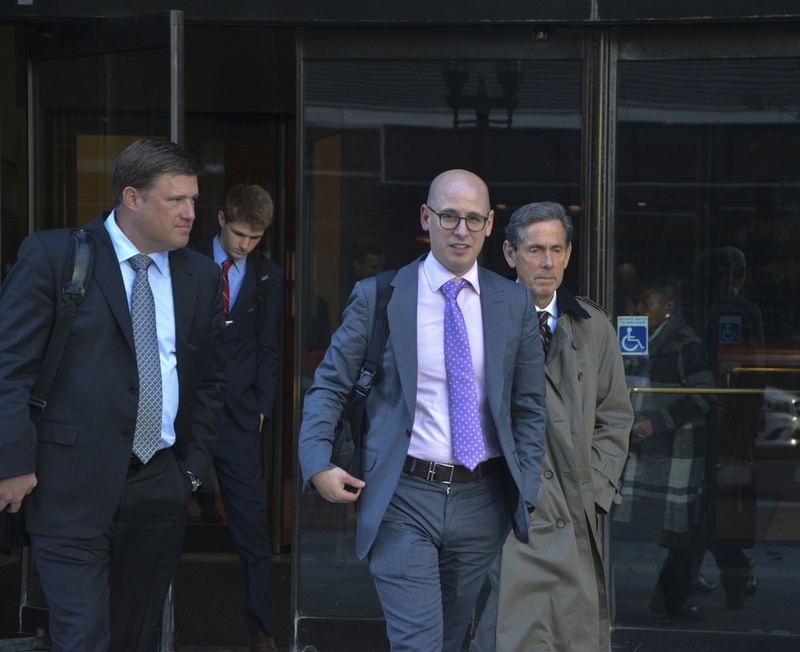 In the morning, Fitzsimmons faced a string of questions from SFFA lawyer John M. Hughes. After a lunch break, William F. Lee '72, the University's lead trial lawyer and the senior fellow of the Harvard Corporation, took over from Hughes and began questioning Fitzsimmons. And the dean isn't done yet — Lee is set to continue quizzing him on day four. WHAT: Hughes sought to prove that Harvard unfairly favors the wealthy and well-connected in its admissions process. He then revived an earlier line of argument by referencing the confidential 2013 report that concluded the College's admissions system produces "negative effects" for Asian Americans. Lee, meanwhile, asked Fitzsimmons to describe the way Harvard evaluates applicants — and later gave Fitzsimmons a chance to discuss his own experience as a low-income College student in the 1970s. Hughes introduced three emails Wednesday morning that suggest Harvard favors applicants connected to families who fund the school. In one 2013 email, former Dean of the Harvard Kennedy School David T. Ellwood '75 thanked Fitzsimmons for helping admit a student whose relatives had apparently "already committed to a building." In another, Associate Vice President for Alumni Affairs and Development Roger P. Cheever ’67 noted that accepting an unnamed applicant could "conceivably" lead to the donation of "an art collection." Read the full story here. Hughes also grilled Fitzsimmons on the "Dean's Interest List," a special and confidential list of applicants he compiles every admissions cycle. Though the College closely guards the details, applicants on the list are often related to or of interest to top donors — and benefit from an elevated acceptance rate. Fitzsimmons defended Harvard's special treatment of applicants with donor ties as "important for the long-term strength of the institution." He noted the tactic helps to secure funding for scholarships, among other things. Hughes then turned the court's attention to the internal 2013 report, which Harvard circulated among top administrators at the time but never published. 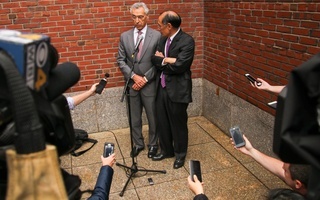 He asked Fitzsimmons whether he told most admissions office employees about the report's finding that Harvard's admissions system disadvantages Asian Americans. Fitzsimmons said he didn't remember. Hughes also asked whether Harvard had implemented bias training since the 2013 report. Fitzsimmons said no, adding he does not believe that kind of training is necessary for Harvard's admissions office. Lee wrapped up day three by asking about the way Harvard contacts students who achieve high scores on the PSAT. Fitzsimmons said the College reaches out to high-scoring applicants in a variety of categories. At Lee's prompting, the dean dove further into the details of Harvard's admissions process, noting the school pursues three main objectives: "truly exceptional students," "diversity of all types," and "no more students than beds." Fitzsimmons also spoke for several minutes about his own time at Harvard. He mentioned that his mother and father ran a mom-and-pop shop in Weymouth, Mass. and said he attended the College "almost entirely with Harvard scholarship funding." Read a full account of day three here. — Staff writers Aidan F. Ryan, Delano R. Franklin, Iris M. Lewis, Molly C. McCafferty, and Samuel W. Zwickel contributed reporting. WHO: Day two of the Harvard admissions trial saw smaller crowds and further cross-examination of the College’s long-serving admissions dean. 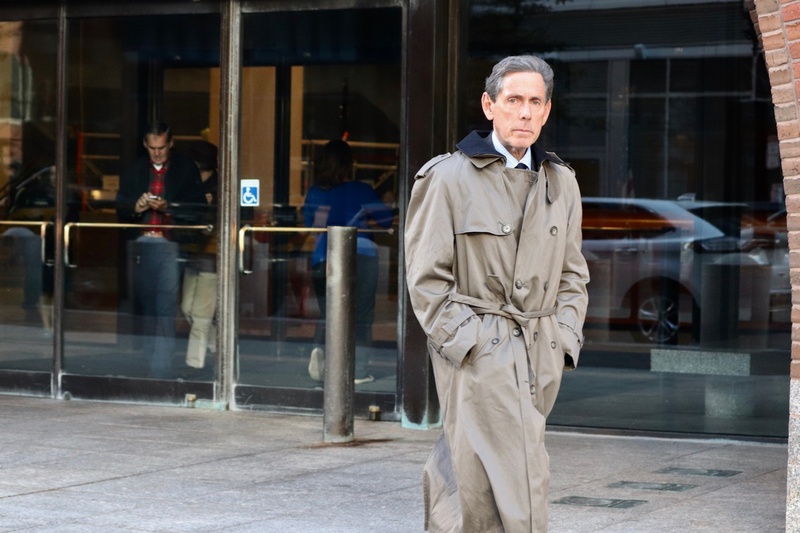 William R. Fitzsimmons ’67, dean of admissions and financial aid, faced down several hours’ worth of questions from SFFA lawyer John M. Hughes. William F. Lee ’72, a lawyer for the University and senior fellow of the Harvard Corporation, objected to several pieces of evidence Hughes presented over the course of the day. After a prolonged discussion about the relevance of one particular document, Fitzsimmons offered a moment of levity. 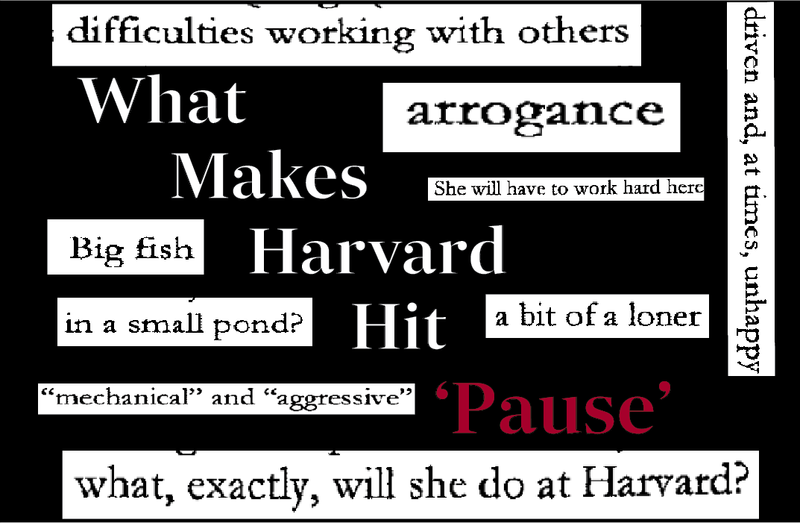 WHAT: Hughes grilled Fitzsimmons on the technical details of Harvard’s admissions process. He was interrupted around 11 a.m. by a fire alarm that forced lawyers, spectators, and members of the press to exit the courthouse and wait outside for roughly an hour in the chilly October air. Hughes began Tuesday’s session by brandishing an internal Harvard document titled “Reading Procedures for Class of 2018.” The document offers admissions officers an outline for assigning scores to applicants. Hughes questioned whether race unfairly informs the “personal ratings” the College gives to applicants — to Asian-American applicants in particular. Documents released over the summer as part of the suit appeared to show that Harvard admissions officers give poorer personal ratings to Asian-American applicants. Fitzsimmons admitted personal scores skew lower for Asian-Americans than for Harvard hopefuls of other races. But he said multiple factors determine applicants’ rankings. “The strength of the teacher recommendations and counselor recommendations for whites is somewhat stronger than those for Asian-Americans,” Fitzsimmons said. Hughes also quizzed Fitzsimmons about a 1990 investigation into Harvard’s admissions process conducted by the Education Department’s Office of Civil Rights. The federal probe examined allegations that the College relied on illegal racial quotas to deny admission to deserving Asian Americans. The department’s final report cleared Harvard of any wrongdoing. Hughes noted that the Education Department report detailed what he called problematic comments some Harvard interviewers made about Asian-American applicants. “He’s quiet, and, of course, wants to be a doctor,” read one. Hughes said these kinds of comments proved that College reviewers stuck to harmful stereotypes about Asian Americans. — Staff writers Alexandra A. Chaidez, Delano R. Franklin, Molly C. McCafferty, Sanjana L. Narayanan, and Aidan F. Ryan contributed reporting. 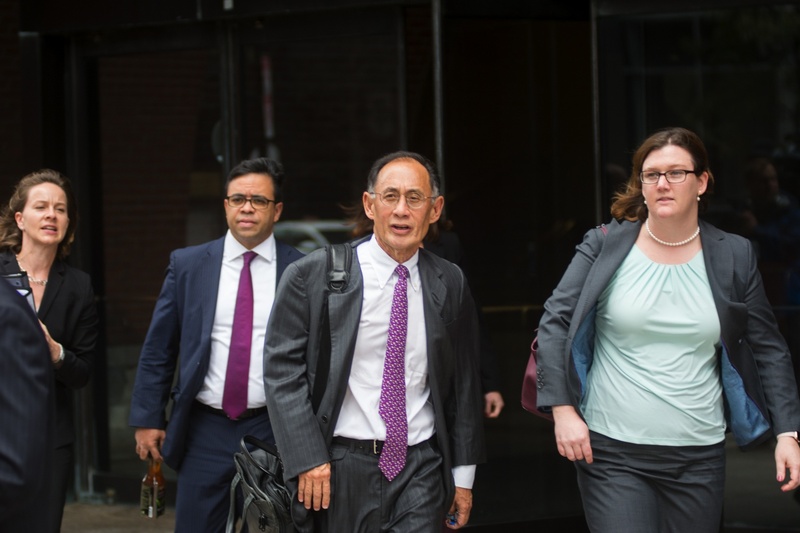 William F. Lee ’72, who is leading the legal team defending the University against allegations of racial discrimination, enters the courthouse on day one of the Harvard admissions trial. WHO: On the opening day of the highly anticipated Harvard admissions trial, hordes of spectators and reporters crowded into two courtrooms and a jury assembly room to listen as lawyers for both the College and SFFA offered lengthy opening statements. Adam K. Mortara spoke for SFFA, while Harvard Corporation senior fellow William F. Lee '72 argued for the University. Later, Harvard's long-serving Dean of Admissions and Financial Aid William R. Fitzsimmons '67 took the stand to answer a long string of largely technical questions from SFFA's attorneys. WHAT: Mortara and Lee mostly repeated arguments SFFA and Harvard have advanced before. Fitzsimmons defended against charges that Harvard neglects to recruit Asian-American high schoolers who score higher on the PSAT and SAT exams than do their peers of other races. Mortara pointed to the fact that Harvard concluded in a confidential internal study in 2013 that its admissions process produces "negative effects" for Asian Americans. He also noted that Harvard admissions officers apparently tend to give Asian-American applicants substantially lower rankings for their personal traits. "You have let the wolf of racial bias in through the front door," Mortara said. Lee mostly focused on legal precedent, asserting that previous Supreme Court cases have long established Harvard's methods form a legal way to consider race in the college admissions process. He also criticized SFFA's analysis of Harvard admissions data. "If you torture the data long enough, it will confess to anything," Lee said. Fitzsimmons confronted charges from SFFA lawyers that Asian-American Harvard hopefuls must earn higher PSAT and SAT scores than high schoolers of other races to earn a coveted letter inviting them to apply to the College. Fitzimmons did not dispute the allegations, but said Harvard's outreach to students is meant to ensure the College reaches "people from all backgrounds." Read a full account of day one here. — Staff writers Alexandra A. Chaidez, Aidan F. Ryan, Delano R. Franklin, Samuel W. Zwickel, and Sanjana L. Narayanan contributed reporting.